I consider these works composite drawings. 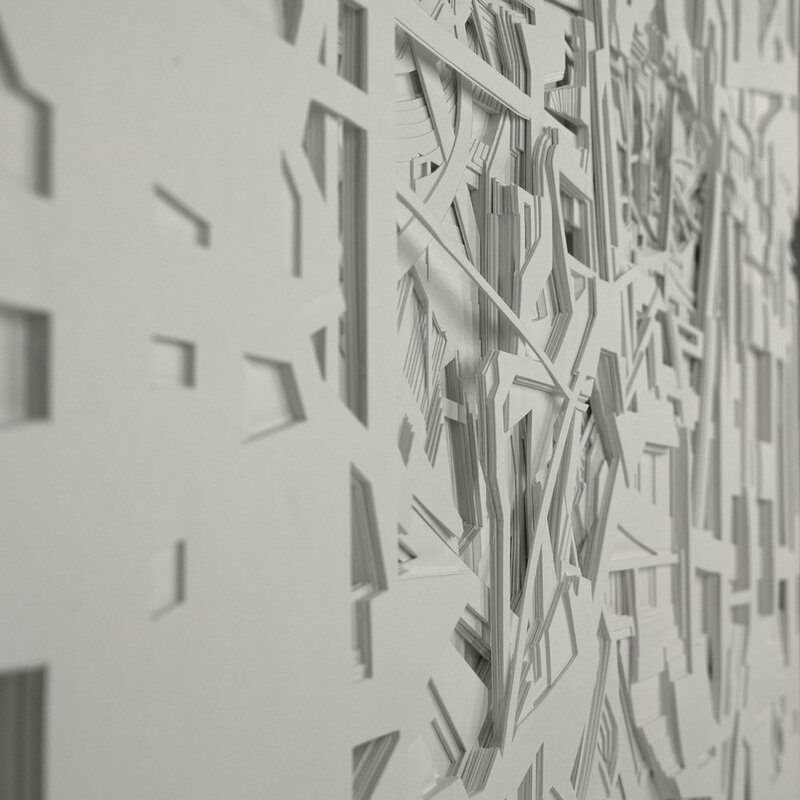 Layers of paper drawn with a scalpel, and progressively combined to form the final object. They also have the sculptural tradition of carving by removing sections from a mass of material. In this way they reside both between and part of both forms of art. Symbiosis was shortlisted for the Royal Academy Summer Show in 2016. Space for redevelopment was selected for the Jerwood Drawing Prize in 2015, and reached the final round of selection for the Royal Academy Summer Show in the same year. Grid was selected for the Jerwood Drawing Prize in 2011. A commission for the design and creation of six sculpted books representing themed watch collections. 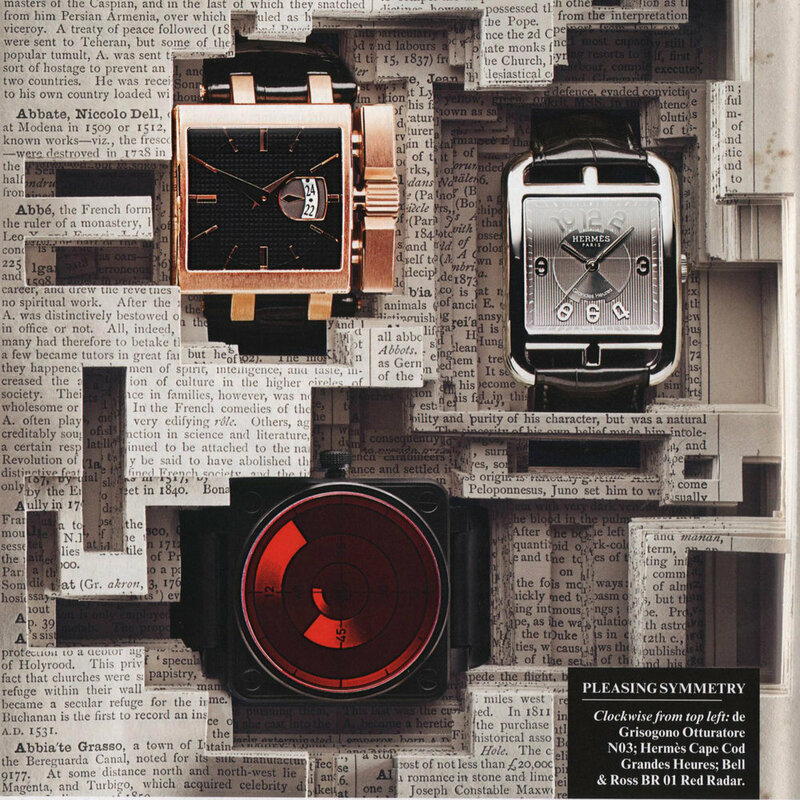 Watches were physically presented in hand-cut books for the bi-yearly supplement for Vanity Fair. Minimalism at the end of the Modernist period championed the grid as an emblem of both social conformity and standardisation, and as a clear departure from the masculinised gestural painting of the Abstract Expressionists. Mechanical reproduction was favoured over the creative touch of the artist raising further the question of the unique art object. The network structure is a contemporary revision of the grid. It reflects not only the human body and brain, but social networks, cityscapes, the organic growth of rhizome roots and the geography of the digital world through its horizontal web of interconnected nodes. Technologically we can look at the development of interactive systems, the internet of things, and the rise of Neural Networks, the branch of Artificial Intelligence that uses learning algorithms to process huge quantities of information to mirror cognitive processes.